Bagrada bug, Bagrada hilaris, is an invasive stink bug first found in Southern California in 2008, but was found in Yolo County in 2014. Fall 2018 has been dry and warm, with days in the low to mid-80°F, favoring significant build up of bagrada bug populations and preventing tail-off of populations. With extended favorable conditions multiple generations and rapid population increase has led to severe damage. Organic management is challenging and no complete control has been identified. However, a multi-pronged IPM approach has potential to reduce populations and crop damage. Bagrada bug (circled in green) on harlequin bug. Bagrada bug nymph (upper left) and ladybug larvae (center right) on a broccoli stem. Adults are black with orange and white markings, nymphs range from solid red-orange (instar) to red bodies with black stripes and a black head. 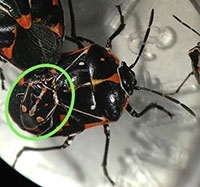 Adult harlequin bugs look most similar to adult Bagrada bug, however, an adult bagrada bug averages 0.25” in length, at least a third smaller in size than the Harlequin bug. Adults are commonly moving in the copulating position, but all stages can be seen crawling on soil and climbing on plants and leaves. While often seen walking, Bagrada bugs readily fly when temperatures reach the mid-80's°F. When approached by equipment or other, adults tend to hide under leaves or even fly. Bagrada bugs are highly temperature sensitive, emerging as the day warms, with peak activity at the warmest part of the day, and seeking cover as temperatures cool. Bagrada bug life cycle lasts 3-4 weeks. Eggs are barrel-shaped and deposited singly or in small clusters of about six on leaves but especially in the soil, hatching in 4 -10 days. Eggs are initially white, but turn orange or red prior to hatching. Depending on conditions, a female bug can lay up to 150 eggs within 2-3 weeks. Bagrada bug preferentially feeds on cruciferous crops (family Brassicaceae), including broccoli, cauliflower, cabbage, radish, turnip, mizuna, arugula, kale, bok choy, and collards, among others. This includes cruciferous weeds such as short pod mustard, pepperweed, wild radish, London rocket, and shepherd's purse, as well as the insectary plant, sweet alyssum. It reportedly also feeds, but to a much lesser extent, on strawberries, melons, and members of the nightshade (potatoes, peppers, tomatoes), mallow (okra, cotton), legume, and grain families (wheat, corn, sudangrass, millet). Populations of bagrada bug are unlikely to build to levels seen in cruciferous crops, since it requires cruciferous plants to complete its lifecycle. Lettuce and spinach are NOT a suitable host for bagrada bug. Using needle-like mouthparts, bagrada bugs pierce plant tissue and “lacerate and flush”, sucking up the liquid plant material. Feeding on leaves produces white stippling and starburst/fan-shaped leaf lesions. Feeding on the apical meristem (growing tip) can lead to blind plants (no head) or multiple heads. Damage to growth nodes can lead to multiple secondary shoots, resulting in stunted or deformed plants. Young crops, For young plants (just germinating up to several leaves), heavy feeding can completely kill seedlings. Bagrada bugs can detect just-germinating seeds, resulting in newly emerged seedlings with bagrada bug feeding injury or new emergence. In Salinas, some growers who find noticeably high mortality of cotyledons skip thinning to maintain a decent crop stand. 1. Scouting of weeds, prior to a brassica planting, or managing weeds. Look for the characteristic starburst/fan shaped lesion on weedy hosts, as well as for the insects themselves. Damage can be easier to find than the insects at low populations. On the Central Coast, where commercially grown cruciferous crops are available nearly year-round, shortpod mustard (Hirschfeldia incana), and perennial pepperweed (Lepidium latifolium) appear to be the two most important weeds for buildup of bagrada bug populations. Most mustards can be hosts, but these, along with wild radish, are probably key weeds for bagrada bug in Yolo Co. as well. When these growing populations of bagrada bugs run out of food in the patches of weeds, they migrate into crop fields in search of food. For shortpod mustard (pepperweed is more challenging), if it is possible to successfully manage weeds when they are still small, you may prevent buildup of bagrada populations from happening. Thinking of bagrada bug as a landscape-scale pest, as opposed to field scale, is a good way to approach population management. With that in mind, managing both hosts that function as reservoir (e.g. brassica weeds) and hosts that aid to sustain their populations in fields (brassica crops), will be more effective. 2. Row cover can protect direct-seeded and transplanted brassica crops. Protecting any type of seedling helps reduce overall damage and prevents extreme damage to a new seed line. By protecting cole crops such as broccoli until >4-5 mature leaves, the apical meristem, or growing tip, will become more protected as the plant grows, reducing the number of blind or multiple heads. Keep in mind this only works if you don't trap bagrada bugs inside the row cover and also that row cover can cause issues with other pests (e.g., aphids). 3. Trap cropping, coupled with crop arrangement, could reduce populations in your focal crop. Trap cropping can be effective at targeting populations as they move from the weedy edges into a field. The goal of trap cropping is to provide an attractive food source for bagrada bug. When the trap crop is infested, management, with chemistry, vacuums or incorporation (when populations are high) may still be important to prevent movement into the main crop. Using insecticides only in the trap crop could help reduce costs. Turnip is worth considering since it is highly attractive to bagrada bug, seed is inexpensive, and germination is quick. The trap crop should be on the edges of fields to intercept bagrada bugs as they move. If possible, order plantings or beds as follows, moving towards the center of a field: field edge -> trap crop -> non-host (e.g. lettuce) -> susceptible host. Turnip trap crop is worth considering since it is highly attractive to bagrada bug, seed is inexpensive, and germination is quick. 4. Monitor the field edges adjacent to ditches and weedy edges early and focus early treatment on this area. Bagrada bug has a strong edge effect, and damage is more severe adjacent to farm edges. If possible, use transplants. Older plants are much more resistant to damage. Transplants also narrow the window where damage is likely to occur. 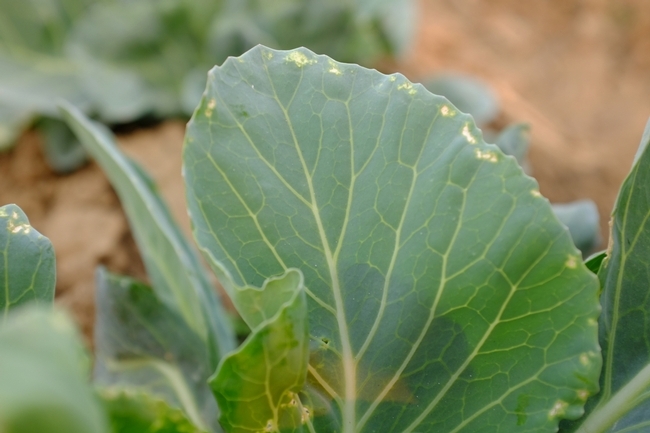 The same idea applies for other brassicas, but where cosmetic damage is important, significant damage can still occur later in the season. 6. Best efficacy has been found with mixtures containing pyrethrins and/or spinosad, in combination with kaolinite clay, azadirachtin, and/or insecticidal soap. In conventional management, pyrethroid chemistry has the most effective knockdown and residual control. However, options for organic systems have much lower efficacies and shorter residuals, making management more challenging. In multiple studies, stand-alone applications of pyrethrins, spinosad, and azadirachtin have been significantly less effective then in combination with other materials. Significant damage could still occur with high populations. As contact herbicide, application is best during warm days when bugs are active. The following are combinations with promising efficacy. Consider multiple applications in shorter time intervals (4-7 days). bThe rate of M-pede used in the study was 2% of the water volume. Typically, 2% of M-pede is considered as a high rate and increasing the rate (> 2%) may cause phytotoxicity (burning of leaves). cBecause Surround could clog the spray tanks, it requires rigorous agitation before application. Also, because Surround easily comes off from the leaf surface with sprinkler irrigation, reapplications are warranted if irrigated at closer intervals especially during the early stages of the crop. dConsider applying in the evening to encourage fungal germination to minimize reduce spore desiccation from a warm day. 7. Essential oils did not deter bagrada bug, except geraniol may have potential to suppress Bagrada bug activity. In a controlled study evaluating bagrada bug response to essential oils, geraniol was the only oil that elicited a behavioral response by adult bagrada. This study was not a field trial, but rather a test of concept to screen for a response in activity. Essential oils tested included citronellal, lemongrass oil, peppermint oil, thyme oil, rosemary oil, pine needle oil, limonene oil and vetiver acetate (Joseph, 2017). 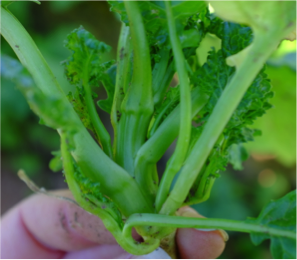 Black traps are most effective, however, a pheromone lure or other lure that is much more attractive than cruciferous crops has not been identified. At this time, sweet alyssum is a good choice as a lure and 100-1000 bugs can be trapped to a single trap, but this is often not enough to reduce damage and will occur when populations are already very high. Traps may be useful as an early detection tool, although scouting weeds and your crops has a better chance of success. Grettenberger, Ian, Jhalendra Rijal, Richard Smith, Larry Godfrey, and Shimat Joseph. Bagrada Bug Update: Organic Management. Presentation February 2016. Joseph, Shimat V.. 2018. Lethal and Sublethal Effects of Organically-Approved Insecticides against Bagrada hilaris. Journal of Entomological Science, 53(3):307-324. Joseph, S.V., I.M. Grettenberger, L.D. Godfrey and N. Zavala. 2017. Susceptibility of germinating cruciferous seeds to Bagrada hilaris (Hemiptera: Pentatomidae) feeding injury. Arthropod-Plant Interact. 11: 577–590. Joseph, Shimat V.. 2017. Repellent Effects of Essential Oils on Adult Bagrada hilaris by Using an Olfactometer. Southwester Entomologist: 42, 3: 719-724. Joseph, Shimat V.. 2014. Bagrada bug monitoring: Does trap color influence bug captures? Salinas Valley Agriculture blog. August 7, 3014.